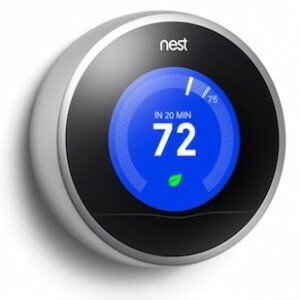 I’ve been seriously considering getting the Nest Learning Thermostat for the house. It’s a learning thermostat, as opposed to a straight programmable thermostat. What that means is that the thermostat learns from your behavior about how it sets the temperature in your house. So, for example, if it learns that you’re away from 8:30am to 3:30pm each day, it’ll readjust the temperature in the house to save some money on your heating and cooling cost. With a regular programmable thermostat, you have to set this up yourself. One of the ways that it does this is by sensing when you’re not home. There’s a sensor in the device that detects when you walk by it. One of the reasons I’ve been holding off on getting it so far is that our thermostat is in a location in the house which we don’t walk by very often. So, what to do? Well it turns out that Nest makes another product, Nest Protect Smoke and Carbon Monoxide detector, which can help. Not only can this device detect smoke and carbon monoxide, but it also has sensors in it so that if there’s a false alarm (like, say, burning toast), you can turn it off by waving your hand. The cool thing is that the Nest Protect can communicate with the Nest Learning Thermostat, which effectively increases sensor network in the device. 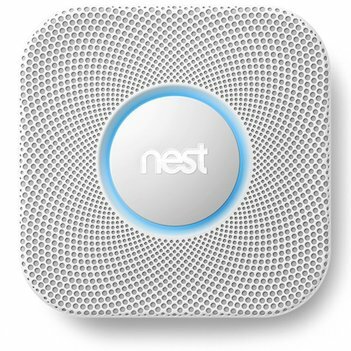 That means, even if your thermostat is in a weird place that people don’t walk by very often, walking by a Nest Protect smoke detector will send a message to the Nest Thermostat, telling it that someone is in the house. Devices that communicate with each other, enhancing their effectiveness. Very cool!